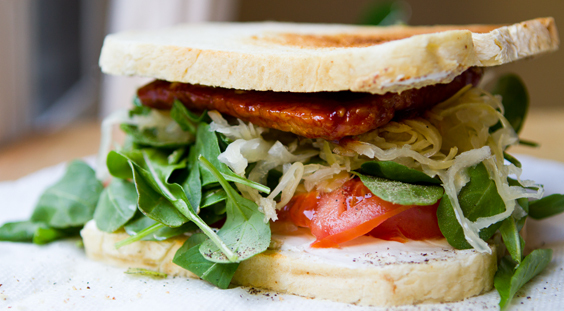 15 Sandwich Truths! 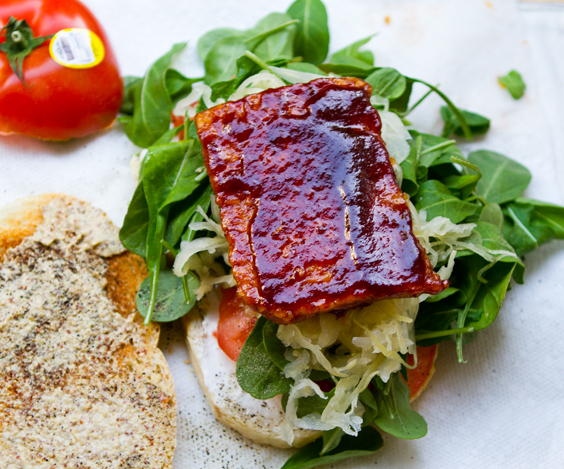 And my BBQ Tempeh Kraut 'Wich. Easing myself into 2012 after a very busy holiday food season, I keep coming back to simple, fresh, healthy, delightful sandwiches. Post-holiday is the perfect time for me to cool my oven a tad and settle into some easy, totally-appealing meals featuring three components: light healthy salads, hearty homemade soups and delicious cravable sandwiches. Yup, my early January fare: a rotation of soups, salads & sandwiches .. (and maybe a few smoothies too.) Wanna join in?? So in the spirit of my feast of sandwiches, I've come up with 15 Sandwich Truths. 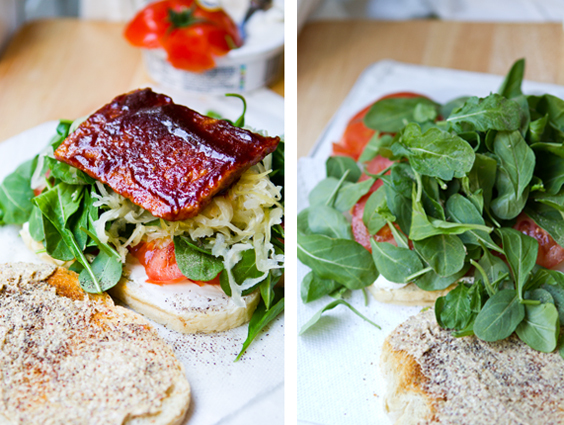 And a super yummy recipe to pair with my list: my BBQ Tempeh Kraut Stack Sandwich. With overflowing heaping handfuls of fresh baby arugula. Happy 2012, vegan-sandwich-style..
1. Pep-it-Up. 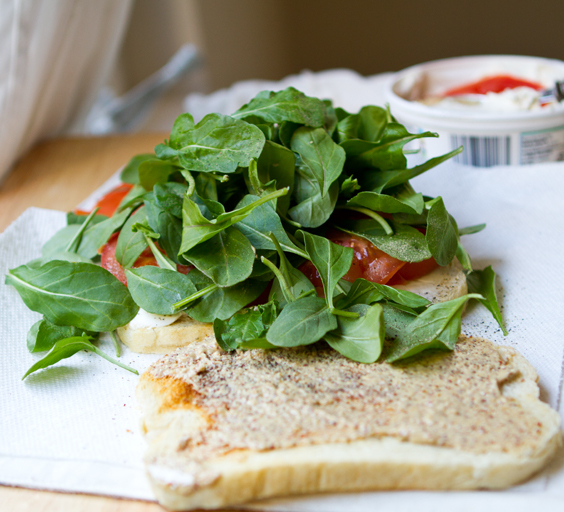 Never underestimate the power of black pepper sprinkled over the interior of a sandwich. 2. Peace on Earth Eats. Sandwiches are a vehicle for peace and unity among humans. Have you ever met a person that doesn't like a good sandwich? 3. Perks. BBQ sauce, spicy mustard, pickles, fresh lemon juice, hot sauce or sauerkraut are tried and true ingredients to liven up a sandwich. 4. Your Bread Base. Really good sourdough, toasted, is a go-to bread for most sandwiches. And yes, "the bread" for your sandwich can make or break its success, so choose wisely. Fresh is best. Lightly toast to bring out the nutty aroma of the grains. 5. Splash it. 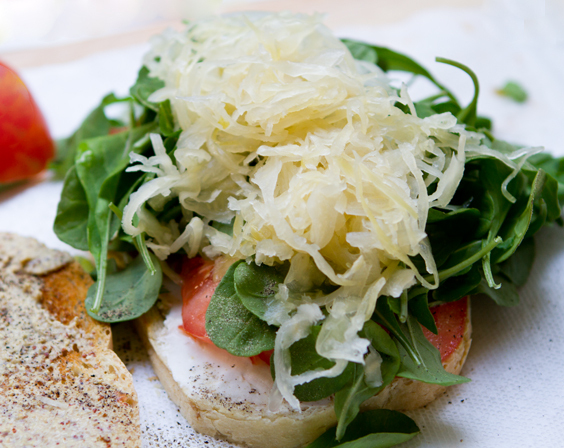 A splash of oil and vinegar (is not just for salads) - livens up a sandwich too! 6. Drown it in Greens. 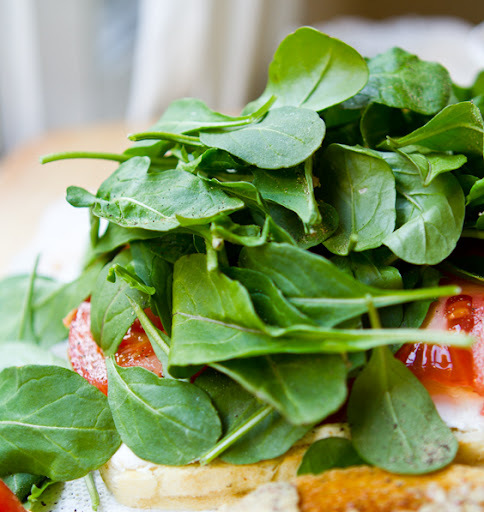 Always pile on as many greens as will stay on the sandwich. Veg-overflow is an expected outcome of a well-stacked sandwich. 7. Side Sip. Lemon iced tea, lemonade and most fizzy beverages greatly enhance your sandwich eating experience. 8. Nix the Piled-High Chips. If you are devouring an entire bag of fried potato chips after you've finished your sandwich: you didn't make your sandwich big enough. Perfect sandwiches don't need gobs of chips. A few chips, sure. This same truth goes for fries. 9. Kiddie Kreations. Kids make the best sandwiches. No really, give a six year-old two slices of bread and watch magic happen. 10. Veganize it. 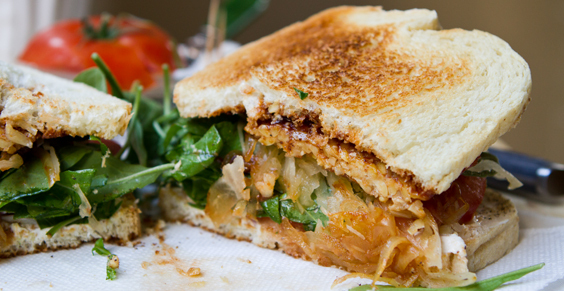 Pretty much any classic sandwich recipe can be veganized. Tempeh bacon, vegan chick'n and dairy-free cheeses made this happen. Even "Egg Salad" has a vegan version. 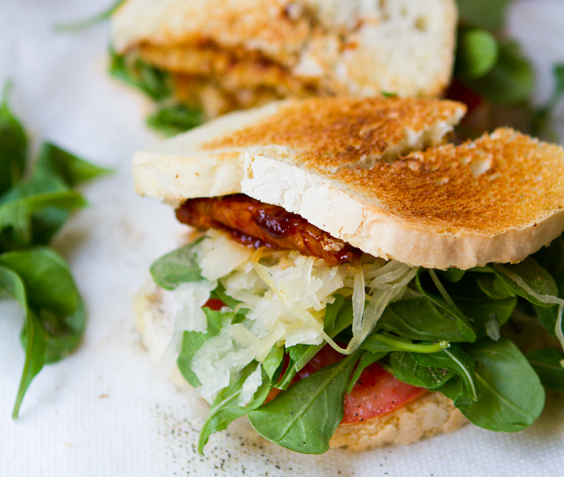 Challenge yourself to veganize your fave (or your family's fave) classic 'wich. 11. Good Stuff Tastes Good. 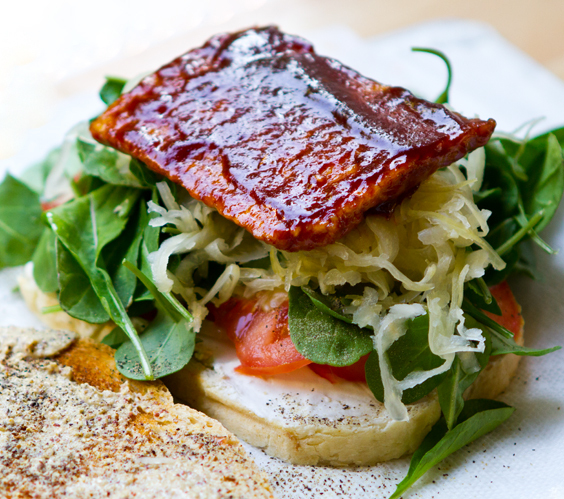 Truth: A sandwich doesn't have to have crap on it to taste amazing. Exhibit A. And B. And C. And D through Z here. 12. Picnic-Approved. Sandwiches are the perfect picnicking fare. Your hike, day at the beach or romantic stroll through the park will thank you. All you need to do is a little prep work at home for to-go meal bliss. 13. The Minimalist. 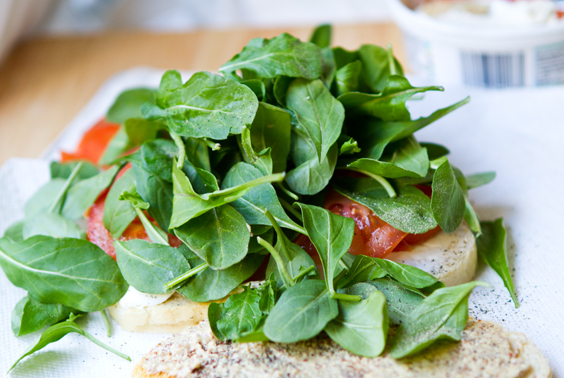 A good sandwich only needs a few high quality ingredients. If you don't have high quality ingredients for your sandwich, don't bother. 15. Best Meal Ever? A simple, hearty, elegant sandwich may taste better than a four course, lavishly constructed meal at a five-star restaurant. Truth. Lets get to it. Recipe ahead..
vegan, makes a few sandwiches.. Directions: Toast bread. Pile high the directed toppings and devour per instructions and 'truths' above. Enjoyment always follows a good sandwich. 1. Slice your tempeh into thin squares. 2. Heat a tablespoon of safflower oil in a saute pan. 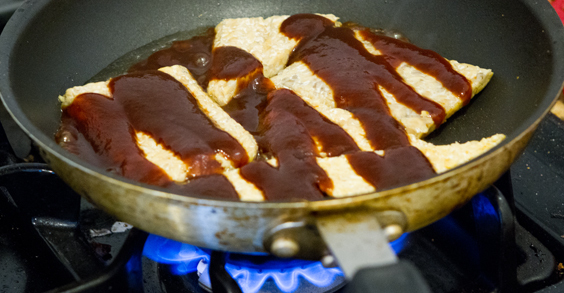 Over high heat, add in the tempeh to sear on each side. Cook for about 1 minute. Then add in a drizzle of your favorite BBQ sauce. 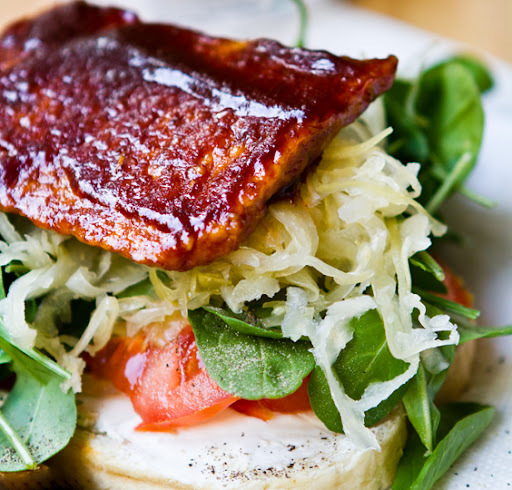 Coat tempeh well. 3. Reduce heat and saute for 2-3 minutes, medium heat. Cool a few minutes before adding to sandwich - to allow sauce to firm up and become sticky. Stack on sandwich to serve! Kraut lover's delight. Healthy kraut is rich in probiotics!